Despite costing thousands of dollars per door, access control systems are inherently vulnerable to an easy exploit called 'tailgating'. Unless this threat is recognized and addressed, even a friendly hand can compromise a huge security investment. In this note, we take a look at 'tailgating' and common steps in dealing with the risk it presents. 'Tailgating', also called 'piggybacking' by some, describes the situation when a credentialed person opens a door allowing one or more individuals to immediately pass through while the door is open. The effect of this simple action can render an entire facility unsecure. This can benignly occur (when holding a door open for someone), accidentally (when someone is focused on hurriedly making it through an open door), or as a malicious act (where someone is deliberately trying to beat the security system). Politeness: In many cultures, holding the door open for people is a warm, kind expression. Likewise, explicitly denying entrance can create ill will amongst neighbors or co-workers. Since many credential holders may not even consider how they are undermining an access control system with their own 'good manners'. User training and signage is often necessary to 'retrain' credential holders on proper use. Bad Weather: Especially in rainy and cold climates, holding the door open offers a welcome shortcut to those seeking the warm and dry environment of a facility. In these cases, sheltered entries, windbreaks, or awnings help diminish the tendency to hold open doors out of environmental harshness. Misaligned/Worn Doors: Over the course of thousands of open/close cycles, even commercial grade doors, hinges, frames and closers sag or become worn over time. If left unchecked, doors may not fully close when opened or may take a long time to close, therefore allowing many people entrance from a single card read. 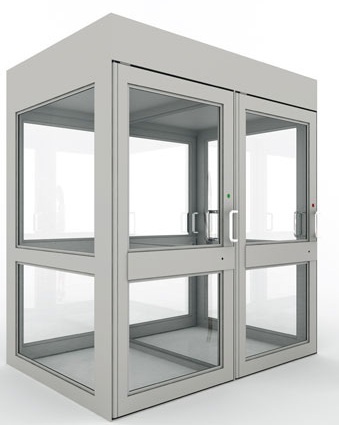 A regular and discipline door maintenance schedule for access controlled openings is critical to prevent the issue. Inconvenience/Laziness: There are a variety of simple ways to keep a door from latching after it has been opened. Doorstops, rocks, bunched-up rugs, and hardware tampering are all commonly employed to eliminate the task of presenting a credential for access, often seen as onerous by employees. For this reason, consider embellishing 'smoking area' doors or delivery entrances with cameras and intercom systems to mitigate tampering and provide other communications paths for outside access. 'Hold Open' Alarms: Many access control systems have the ability to monitor door contacts - simple switches that check whether a door is closed or not - and can be set to alarm if a door is held open for too long. Alarming occurs on doors open longer than a few seconds, thereby indicating that multiple people are passing through a 'held open' door. However, while this is a low-cost or free measure for combatting tailgaters, it also is the biggest source of nuisance alarming when implemented. Unless a facility actively monitors its access control system, this solution is likely to be (promptly) dismissed as irritating and ineffective. These installations have a variety of operation uses beyond security; in some cases the function as airlocks to segregate 'clean room' environments from outside contamination, or they are used as inspection checkpoints for contraband. These installations are substantial, and because they use multiple sets of doors and have large physical footprints, they are among the most costly anti-tailgating measures. While solutions abound, the 'best' option is an inconclusive matter to resolve. 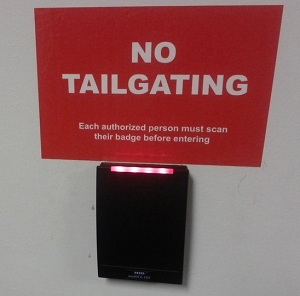 Many security managers faced with tailgating simply rely on repeated instructions and signage to remind credential holders about the issue. Lacking the funding or organizational will to eliminate the issue, the vulnerabilty (and subsequent risks) of tailgating remain. In those cases where tailgating must be prevented, the use of turnstiles and manways is common. However, due to the cost of these solutions, many end users find them too expensive and instead opt for less costly (and less-effective) options like Piggyback Detection or Video Analytics.